A flag carrier is a national airline, an airline that ‘flies the flag’ internationally. Once upon a time you could add ‘at great expense’ because most flag carriers seemed to be bottomless pits for government money. Some of them still are and in Europe that description particularly applies to Italy’s Alitalia which continues – somehow – to fly, despite European Union rules about the Italian government not being allowed to prop it up any longer and despite its market share continuing to dwindle away. When I flew in and out of Bologna in Italy a week ago you would have sworn that the Italian flag carrier was Ryanair. Most of the aircraft arriving and departing from Bologna, even if they were flying somewhere else in Italy, belonged to that popular Irish airline. ▲ Another Ryanair 737 turns up at Bologna Airport. ◄ Their national airline may lose money, but the Italians still do things with style. 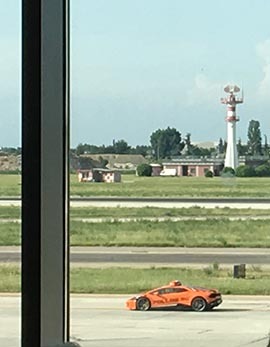 A Lamborghini ‘follow me’ car at Bologna Airport. Of course lots of flag carriers from British Airways to Singapore Airlines are fully viable businesses these days, but some governments still seem to feel it’s important to have their own airline flying the flag, no matter what the cost. South African Airways for example which has been losing money hand over fist for years as a recent article in Skift explained. It is, along with Ethiopian Airlines and Kenya Airways, one of the African airlines which does provide good service to lots of countries. Once upon a time going from one country in Africa to another often meant ‘via London or Paris.’ Although today the airline which flies to more African destinations that any other is probably Turkish Airlines. Even worse than a flag carrier losing bags of money is a flag carrier not carrying the flag anywhere and Africa certainly has one of those as well, in Zimbabwe. Air Zimbabwe, the national airline, is comprehensively bankrupt with US$300 million of debts and no routes anywhere – if one of their aircraft turned up outside Zimbabwe it would probably be seized against the airline’s debts. Grace Mugabe’s enthusiasm for borrowing Air Zimbabwe aircraft for shopping trips probably didn’t help the bottom line, nor did Simba Chikore, Mugabe’s son-in-law who was Chief Operating Office while the airline didn’t fly anywhere and ran up that mountain of debt. So in mid-April what should fly in to Harare Airport, Zimbabwe, as reported by the onemileatatime website, but an ex-Malaysian Airlines Boeing 777 looking very much like an Air Zimbabwe aircraft except the name on the side was Zimbabwe Airways. Furthermore the registration was Z-RGM – surely nothing to do with former President Robert Gabriel Mugabe? And who should be on board this redundant 777 (it had been sitting idle in Malaysia for two years) but Simba Chikore, but only because he had been signed up to assist ‘with technical support during the negotiations since he has vast experience in the aircraft industry,’ according to a Zimbabwe government official. Sadly the vast experience didn’t extend to organizing anywhere for Zimbabwe Airways to fly their 777 or to recruiting any pilots to fly it. So after sitting on the tarmac for several weeks it was flown back to Malaysia on 25 May 2018 and remains there. Presumably so does the Zimbabwe government’s US$40 million purchase price. The new airline (Zimbabwe Airways) was going to allow the old airline (Air Zimbabwe) ‘time to recover’ from its precarious financial position although quite how when it isn’t flying anywhere is unclear. Incidentally the busiest international route in Africa is Harare-Johannesburg with 15 daily non-stops when I looked on Skyscanner. Five of them with South African Airways, none of them with either Zimbabwe operator. Another troubled African flag carrier with a recent aircraft purchase? Air Tanzania, which it appears is not flying anywhere outside Tanzania at the moment, has just laid out the money to buy one brand new Boeing 787 Dreamliner. One. That’s quite a fleet and it appears they might intend to fly it between Dar es Salaam and Mumbai, but don’t hold your breath. Flying to India brings us to Air India, the money-losing, if not bankrupt, Indian flag carrier. Last year The Economist asked ‘Who would buy Air India?’ when Narendra Modi, India’s Prime Minister, announced this Indian government-owned icon was going to be sold. 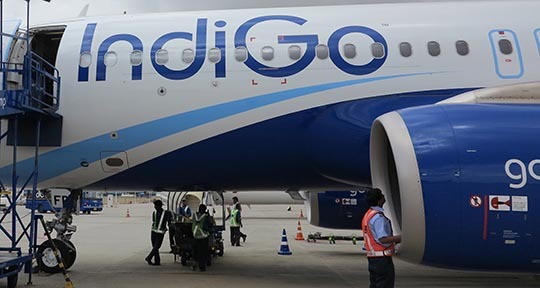 Perhaps to IndiGo, the private Indian airline which controls 40% of the Indian domestic market? That’s three times as much as Air India’s 13% (and declining) share, for which Air India needs twice as many staff as IndiGo. Hardly surprisingly when Air India was put up for sale not a single interested purchaser stepped forward. ‘Plans to privatise India’s flag-carrier have run into turbulence’ reported The Economist on 6 June 2018.